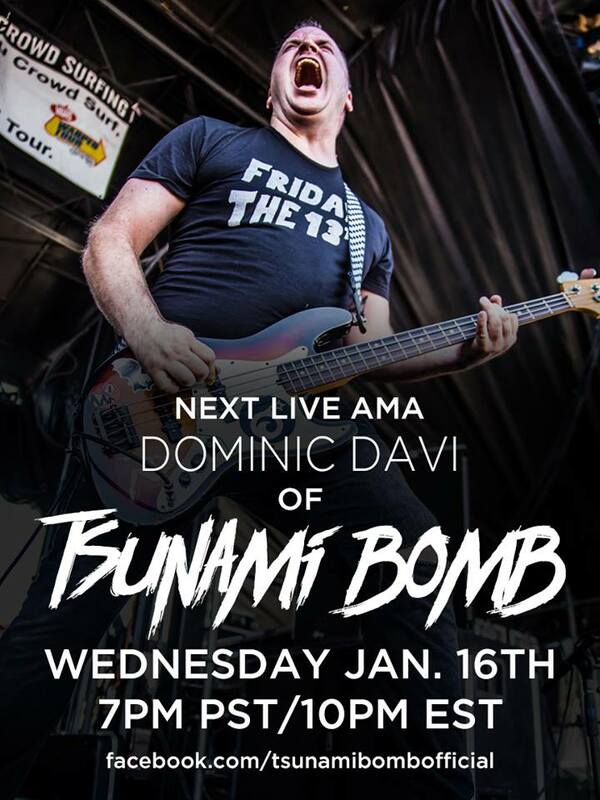 We will be hosting our 4th FACEBOOK AMA is TODAY, JANUARY 16TH at 7pm PST/10pm EST: Bassist and founder of Tsunami Bomb, DOMINIC DAVI will be answering your questions about the upcoming album, the coming shows, what's next for the band this year, and pretty much any question you've ever had about anything ever. Find this on our FACEBOOK PAGE or on our INSTAGRAM stories! Dominic is also the host of 3 GIGS Podcast, the co-host of Monster Candy Podcast, runs a clothing line at Dominic Davi & The Dinosaur Factory, artist on the comic "Fear Of A Punk Planet", and the short story "Come Find Me", and the label head of Alternative Tentacles Records. This will be his first solo AMA ever. So stop in and say hi!